The European Exchange Academy (EEA) was founded in 2003 as an answer to the growing incapability of regular European art academies. The EEA wants to create the best conditions for artists of the future. The insufficient educational structures at art schools, the short time teachers can talk with a student, the very short time students can study in general, all these evolutions need counterweight. The EEA is created to an art-academy that provides all the best for motivated international art students. Here they will be able to work and live in a short period of time (four and a half weeks) in an isolated setting. The exciting place to do so was found in a vast, deserted clinic in Beelitz Heilstätten, 40 km. south of Berlin, Germany. Every year since 2003 there has been a group of about 40 participants, coming to Beelitz-HeilstŠtten from academies in Leeds, Helsinki, Brussels, Amsterdam, Berlin, New York, Xiamen, Utrecht or Zwolle. Since 2003, a number of 24 nationalities were counted by EEA participants and advisors. A core team of about 5 advisors completed with a number of 6 to 8 guests-advisors doing short workshops or lectures. 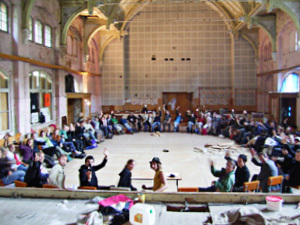 This unique enterprise is lead by Harry Heyink, being the artistic director of the EEA together with Gerd OhligschlŠger, Beelitz-specialist and business-director of the EEA since 2003. This unique duo navigates the EEA-organisation every year in order to provide an ideal setting. Utopian discussion groups are formed. There is a wood- and metalworkshop filled with tools and there is personal technical support. There is a media-lab with a basic of computers. There are personal studios available for the participants. Next to the daily meals extra vitamines are served. What do EEA-participants gain from this experience? You will find out in witch way your work communicates; immediate response is given, loads of attention all for you. You will be able to focus on your working-process for 24 hours a day. You will recognize other people’s talents and learn to use thosetalents. You will learn to fail and you will find unexpected gifts within yourtalents. You will feel responsible for your work and position. You will build up a very important international network for the rest of your life. You will be able to express your position as a young artist. You will never forget and you will see people don’t want to go home anymore, after four weeks. Visual art is created in a self motivated process. In this process, reflection and production are equally important. Visual art is a reaction on society’s reality as well as an intrusion in it. Nowadays, as society’s reality is largely defined by globalisation and the transformations towards a network-society, visual art is more international than ever. In 2004 Charles Esche published a research on factors determining success of several important art academies. Decisive according to him is the energy between students, commitment and courage of staff and the external political and social circumstances. The curriculum and the philosophy of an academy are less important than the extent to which students can work against the system. The EEA was established in 2003 after a few years of experimenting with principles that are close to Esche’s findings. Starting-point was a limited amount of time for a project of no longer than a month in which participants and advisors could partake with a maximum amount of energy. The EEA concept is based on the ‘limited time with maximum devotion’ principle. Factors that enhance the own motivation and reflection. An inspiring breeding ground in which the international character of art can flourish.